I have developed a very specific design aesthetic for my work--it's a combination of influences that range from Victorian and Edwardian to Tim Burton, Steampunk, Cirque de Soleil and vintage Circus attire. It has evolved over the last three years as I've allowed myself to be influenced and inspired by various bits that I've discovered while doing research for my "style". I've also been diligently planning my art fair booth, and as some of my last few posts attest I've ordered banners and planned out the look in my head. 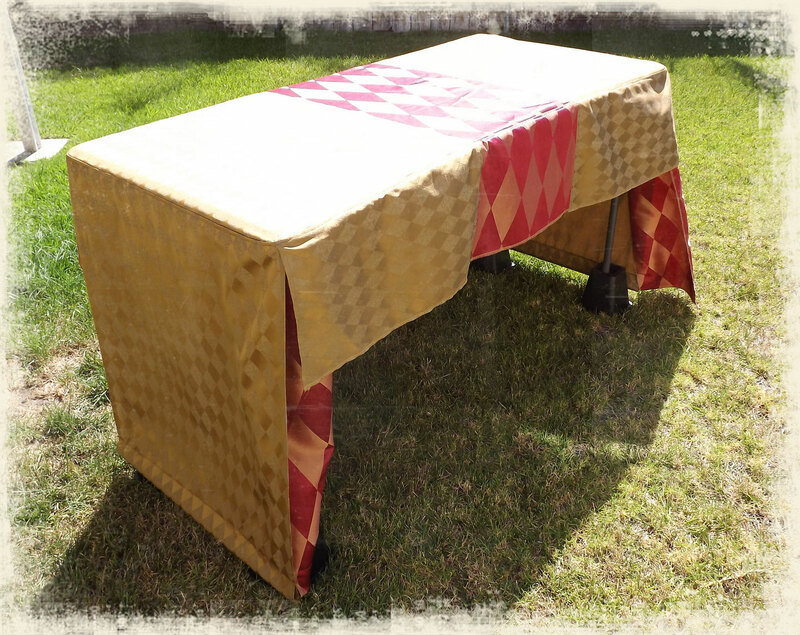 One of the steps toward that finished layout included purchasing tables and making custom tablecloths for them in a style that would compliment the items I make and sell. Finding the right size table was a bit of a challenge--most of the traditional folding tables are either square (like a card table) which made them too short for what I wanted to do, or 6' long--which made them too long! I wanted to put two side-by-side on one side of my tent along a stretch of 10' wall. Eventually, I found a smaller, plastic top folding table with dimensions that would work--5' long and 28" wide. 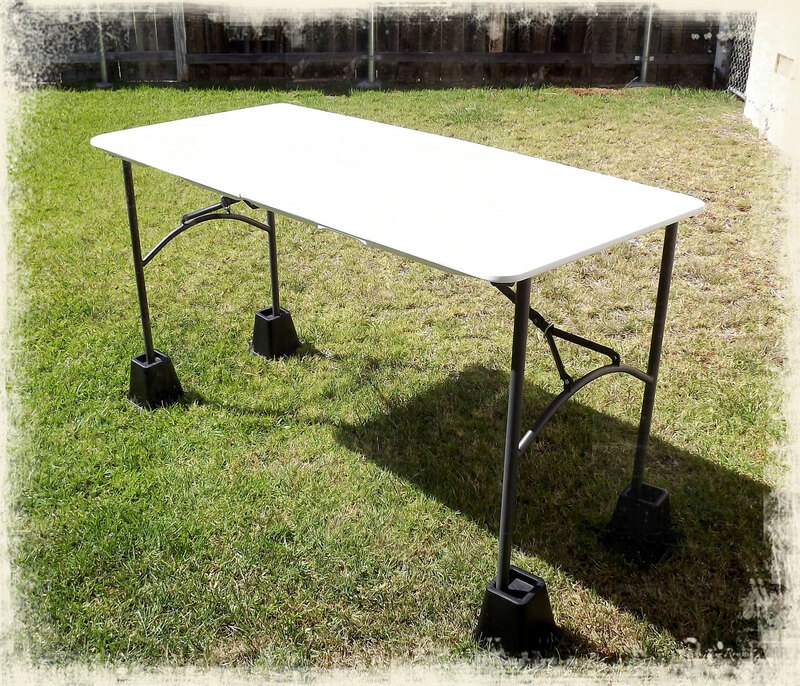 I could put two tables next to each other, and not have them stick out of the end of my tent, nor create wasted space in a corner. They fold up, have a convenient carrying handle, and are lightweight. They were a bit low for me--I wanted the customer to not have to bend over too much to see what was on display, so I purchased some table risers to place under the legs. While they are lightweight plastic, I may have to fill them with concrete or mortar so they are sturdier. My pieces are so lightweight, they won't add much sturdiness to the whole setup, so a heavier riser will be to my advantage. They also have a wide top, so I can place the tables end to end on the same risers in the middle. They raise the surface of the table top by 5", which I felt was necessary. Finding a tablecloth with texture wasn't as fruitful. The ones that I could find were either unfitted (which would billow out of control too much in a breeze, which I felt looked sloppy) or a plain color which did nothing for my design aesthetic for the tent. So instead, I made some from some fabric I already had in my stock, which I had intended on making clothes out of... I guess it found a better use... And here are the finished pics! I made a casing at the bottom of each side so I could insert dowel rods, keeping the tablecloth neat and crisp. 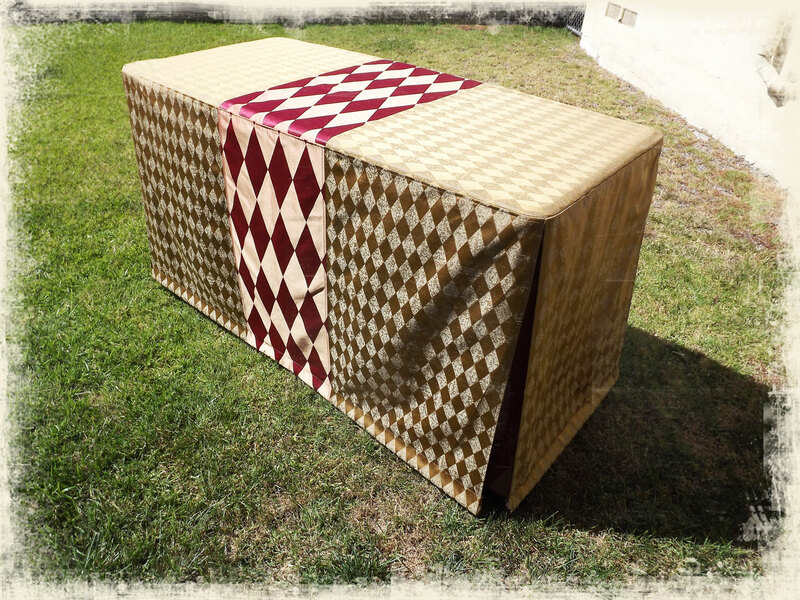 Personally, I am not a fan of gathered tablecloths as I've seen random fair pics where the tablecloths whip up over the top of the table, disturbing displays and generally reeking havoc. 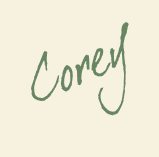 I figured I'd make some that I could exert a bit more control over. At each corner is a tiny "pleat" of matching fabric to the top band, so there's a nice contrast. 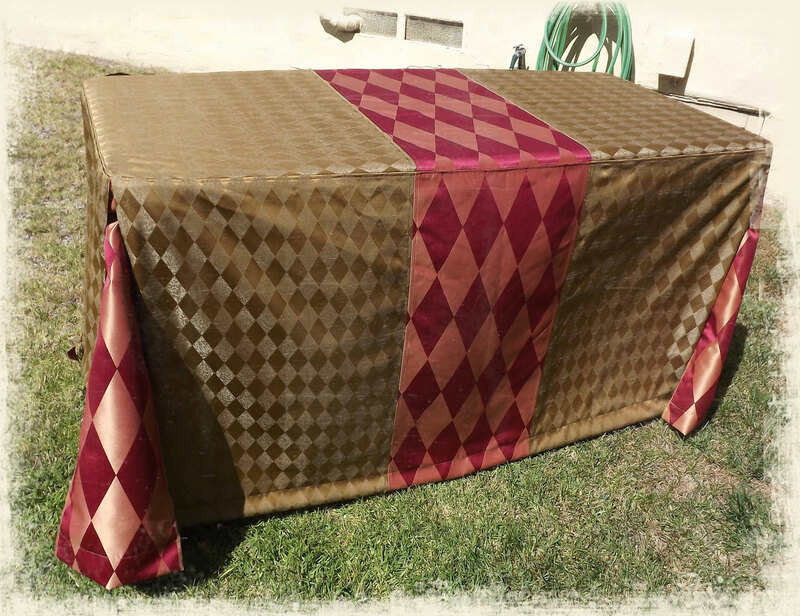 While a solid block of color for tables lets the display on top be the focal point, I truly feel it's a waste of an opportunity to create a sense of style for one's tent. And while I'm a fan of unobtrusive, clean, and spare display mechanisms for wall art (as most contemporary walls, I would venture to say, are plain colors and wallpaper prints are out of fashion), I think when selling "fashion" defining a style is important. In the back, it is open for easy access. I simply made one side shorter than the other three, and I'll put it up against the wall. This also allows me to sit behind it if I ever need to do that. I think they'll be useful for indoor and outdoor shows. And on top of that, my partner Jonathan (a graphic designer) scanned in the fabric and used it in his design of my banners for the tent, so there is a cohesive feel to everything. 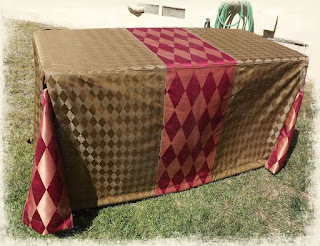 I am very excited about being able to put together the whole tent and seeing how it all comes together. My banners should be arriving by the end of next week, so I may even be able to put the whole thing up next weekend and take pictures to share! If you're interested in having some custom tablecloths made for you, let me know and we can discuss details. While they're not particularly difficult, they did take me a bit of time to make sure everything was working and the casing was the right size, and the hem was correct. But let me know! We can work something out! Until next time, Live Life with Relish! I love these table cloths! I like to make placemats and cushions for the same reason.They really change the look of a room for just a small amount of money. Re your last post..I used to be envious of blogs that had loads of Followers, but like you, my work is just a bit different, and that means a limited appeal.Not that many of us are Eclectic in our tastes, or want to dress "differently"..Pity that.I suppose it's more expensive too. However, making clothes yourself can save so much money!! Of course I totally expected you to make your own table cloth. Very interesting fabric print. My counters at VivoCity craft market where I sell are quite high. Rather different from the conventional heights at other craft markets I've sold at. Over here, we don't provide our own tables. The event organisers take care of that. Welcome! Live Life with Relish! If you're interested in any sort of custom order for a specific garment or piece of jewelry, please email me! We can discuss details and make it happen! Click here to check out my list of suggested reading materials for those interested in Wearable Art!